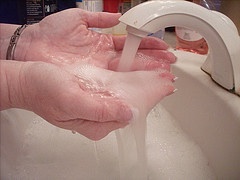 In Mark 7:1-13, the Pharisees questioned Jesus and His disciples about washing their hands before they ate. This was not simply a matter of hygiene for them. To the Pharisees, this was as good as Law. Of course, there was no law that said this. Certainly, the Law spoke of cleanliness and defilement. But there was no law that mandated the washing of hands, cups, pots, and vessels simply to make sure they hadn’t been defiled. The philosophy was apparently that any time they had been out in public, they needed to wash just in case they came in contact with someone or something unclean. By washing, they wouldn’t make their food unclean and wouldn’t internalize any uncleanness while eating. That makes some sense to me. I can see how a logically minded person might take these steps, just to be on the safe side. After all, defilement is serious business. For the Pharisees it became extremely serious business. It was a test of spiritually. It was a test of fellowship. They were sure that through their logical deductions, it was part of God’s pattern for them. Yet, Jesus turned that understanding on its head. This was a tradition they had built up around the Law. It was not God’s Law itself. Jesus accused the Pharisees of hypocrisy. They honored God with their mouths and not really with their hearts. They elevated the teachings of men to the level of God’s command. Was it wrong to wash their hands before eating? No. Was it wrong to wash their hands if they feared defilement? No. What was wrong was to mandate this tradition as if it were equivalent with God’s law and treat others as if they were disobeying God when they didn’t follow the tradition. Is it lawful to have two assemblies on Sunday, Gospel meetings that last all week, and to dress up for our assemblies? Of course it is. Does God mandate it? No. Are we allowed to do these things? Certainly. Are we allowed to mandate these things for anyone else? No. Are others allowed to mandate these things for us? Absolutely not. Are we more spiritual for doing these things or for not doing them? Of course not. Today it is pretty to vogue to notice the side of this teaching that rebukes equating our traditions with God’s law and pattern. But we must not forget this other side. We cannot refuse to follow God’s pattern and Law by our traditions. Do you notice that nowhere does the Law specifically say that caring for elderly parents is part of honoring them. Rather, God expected right thinking people to realize caring for elderly parents was part of that pattern. They had to use their logic to realize this. But it was, nevertheless part of God’s pattern. We certainly cannot mandate traditions like multiple assemblies, week-long Gospel meetings, or formal dress for assemblies. However, when the pattern says sing, we can tell folks they should sing and not add instruments. When the pattern says celebrate Jesus’ death through the Lord’s Supper, we can tell folks they should not add extra holy-days. When the pattern demonstrates using unleavened bread and fruit of the vine for the Lord’s Supper and taking it only on the first day of the week, we can rebuke others for violating it. God expects us to use our common sense and our logic. But He also expects us to use it to understand what He has written, not mandate whatever we like and disregard whatever we don’t. We must not add our traditions to God’s laws. Neither must we allow our think-sos to disregard God’s laws. We must forever recognize that God’s word provides us the pattern and authority for good works and continue to look to it as the guide for our behavior as Christians and work as congregations (II Timothy 3:16-17).